NEW YORK – The appointed hour was 5:15 p.m., Eastern time. 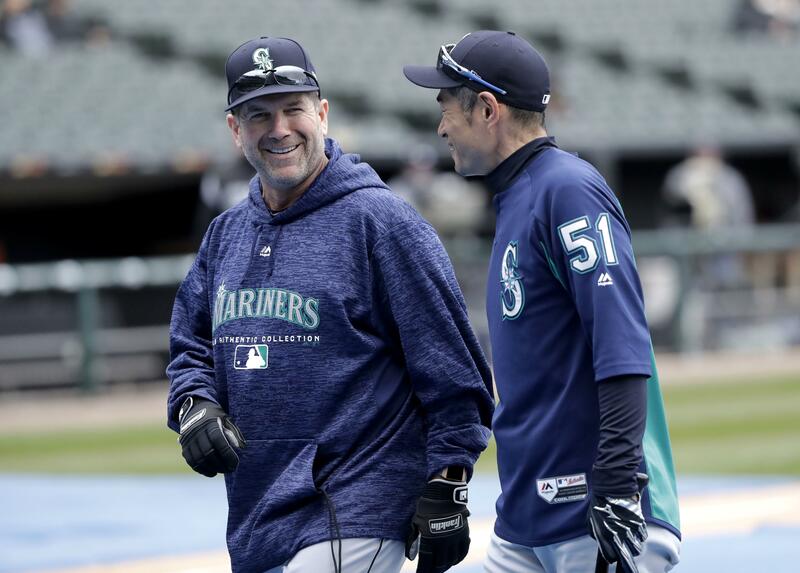 That’s when Edgar Martinez had been told the phone calls would go out to the newest members of the 2019 Hall of Fame class – an hour ahead of the official announcement on MLB Network. Edger and his family – wife Holli, children Alex, Jacqueline and Tessa, brother Elliot as well as close family friend Christi Downs – sat nervously waiting for the appointed hour, waiting for an end to a 10-year vigil. They had decided to fly to New York to celebrate Tessa’s 17th birthday on Monday with a Broadway show and other activities. And, conveniently, Edgar would then already be in town for the big Hall of Fame news conference on Wednesday if his cellphone rang. No red-eye flights would be taken. The ring was everything. Last year, the Martinezes had gathered at their Seattle-area home and waited for the same call. It never came. Talk about letdowns. Martinez fell just 20 votes shy of the 75 percent needed from the Baseball Writers Association of American to be Cooperstown-bound. His prospects this time around looked outstanding, based on vote tracking – but there was still that small shadow of a doubt. And it was his last try, adding even more of an edge. The MLB selection show played in the hotel room with the sound down. The Martinezes looked at their phones, made small talk and waited. Edgar lounged on the couch, feet up, computer on his lap. The tension was palpable. Randy Johnson sent his former Mariner teammate a text of encouragement. The ever-impervious Edgar acknowledged that for the first time in the whole process, he felt nervous. “OK, who has a joke?” Holli called out. Christi came through with a couple of one-liners that we will politely call corny. But they helped lighten the mood. Finally, at precisely 5:15, the phone in front of Edgar buzzed. “It’s a New York number,” Edgar reported. The call immediately dropped off. Cue the collective groan. Mulling it over later, Edgar concluded that, with impeccably horrible timing, it was a return call from the company that manufactured his CPAP machine. He had called earlier in the day with a service question. But the wait wasn’t long this time. Three minutes later, at 5:18 p.m. in New York, and 2:18 p.m. in Seattle, where Martinez has forged a home, and 6:18 p.m. in Dorado, Puerto Rico, where his roots are still strong, the phone buzzed again. Another New York number. This time, it was Jack O’Connell, secretary-treasurer of the BBWAA, to deliver the momentous news. Such simple words. Such profound power. As Holli would say later, the meaning was multiplied by the fact he was carrying the hopes and dreams of two disparate places, Seattle and Puerto Rico. “I think there’s a great sense of depth with seeing two vastly different places in the world celebrating,” she said. Though there were tears in the room, it was news that Edgar accepted stoically, because he’s always trained himself to keep his emotions at bay at times of the greatest stress. It’s what kept him calm in the 11th inning of Game 5 against the Yankees in 1995, facing Jack McDowell. And it’s what kept him calm, more or less, on Tuesday, when the phone finally – finally! – buzzed. He called it a mind trick, and it served him well again. “I had been working through those emotions prior to the call for days,” he said later, in between the swirl of interviews and texts and phone calls that followed the announcement. “Obviously, the way the statistics were moving, it appeared I was going to get in. I had enough time to work through the emotions. Once Edgar got off the phone, the family let out a loud cheer, and they exchanged hugs. They posed for a family selfie. Then Holli gathered them for a poignant toast to baseball’s newest Hall of Famer – though only a tiny handful of people knew it at the time. And they were sworn to secrecy. “Today felt longer than waiting the 10 years,” Edgar joked. Finally, after a spread of food, it came time for the official announcement on MLB Network. That’s when the world outside this Manhattan hotel suite got to find out if Edgar Martinez was a Hall of Famer. And what a surreal moment it was as the Martinez family gathered on the couch to watch Hall of Fame president Jeff Idelson read his name, along with the three other BBWAA electees who will be inducted with him on July 21 – Mariano Rivera, Roy Halladay and Mike Mussina. Another cheer rang out when Idelson read Martinez’s name. Anticlimactic as it might have seemed, it was still thrilling to see it as the masses saw it. And that’s when they learned for the first time Martinez’s vote total, about which there had been much speculation in the room. It was 85.4 percent – a pleasing total to the gathered. However, Edgar expressed sadness that Fred McGriff, who was also in his final year on the ballot, fell short. Elliot Martinez, Edgar’s brother, reported via a text he had received from friends that they were preparing to let off fireworks back in Puerto Rico to celebrate. He related how as youngsters in Dorado, Elliot would throw rocks and pebbles to his brother, hour after hour, that Edgar would hit with a broom handle. Thus was a Hall of Fame career born. Edgar said that in many ways, the 10-year wait for the call, as keenly frustrating as it was at times, turned out to be a blessing. Now the kids were old enough to appreciate the moment – Alex 24, Tessa 17 (and a day), Jacqueline nearly 14. Now he would be able to share it all with them, the coming whirlwind of activity and accolades that will dominate their next five months leading up to Cooperstown. “It has a lot more meaning now,” he said. Speaking of meaning, Holli said that the Hall of Fame means so much more to them because of the support that preceded, and propelled, Tuesday’s phone call. “The biggest overwhelming feeling for us is all of the people that have advocated for this,” she said. “The Mariners have worked so hard and have done such a wonderful job. And so many fans, the Edgar Hall of Fame fans, who have pushed so hard for this. To keep those emotions at bay, Edgar had tried to keep to his routine on Tuesday. After all, a nearly maniacal adherence to routine is what fortified the 18-year major-league career that brought him to this day. But even a placid soul like Edgar Martinez has a breaking point. The nervous energy was rampant all day, Holli said. Finally, in the late afternoon, the two of them slipped away for a quiet moment downstairs. They shared a glass of wine and discussed what loomed just ahead. It was just the restorative break they needed. Hand in hand, Edgar and Holli Martinez headed to the elevator to await the phone call of a lifetime. Published: Jan. 23, 2019, 12:38 p.m. Updated: Jan. 23, 2019, 6:02 p.m.